Sony quietly announced two more PlayMemory applications: Light Shaft and Motion Shot (both US$4.99). This follows the recent Cinematic Photo (US$4.99), Direct Upload and Smart Remote Control (free). 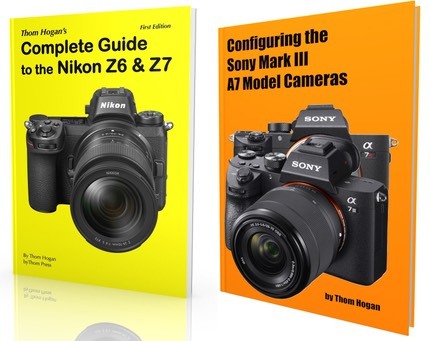 Both are available now for the NEX-5R and NEX-6 cameras. Light Shaft tries to recreate Crepuscular rays (sometimes called God Rays). It also produces stars, flares, and beams. It's basically another of the post processing effects, as it takes an existing shot and creates a new image from the original with the parameters you indicate. Motion Shot also is a post processing application: it takes a series of images you've taken with continuous shooting, and superimposes the moving object on the static background. You'll want to shoot on a tripod with this one so as to keep the background completely static. Then have your subject move through the shot and process using this application. Definitely an interesting application for those who are into motion study. Again, however, I have to say that Sony doesn't quite get it. These applications could live just as easily on your mobile device or your computer and do the same exact thing. Putting them into the camera makes them more gimmicky than useful, as you're using precious battery power and trying to do semi-serious image processing work on a 3" VGA display. So far, the true camera-involved applications (Bracket Pro, Multi Frame NR, Smart Remote Control, and Time-lapse), leave a lot to be desired and often are really no more than charging for (and/or complicating) a function that is done as well or better with built-in firmware in other cameras.